So, my friend Daniel and I are going into self-publishing ebooks. Since I first met him I’ve admired him as a writer writer and have happily collaborated with him on illustrating his “Wild Life” stories, and being a co-auther on Cookrookery. And so we are now teamed together under the Good Port Publishing umbrella. There’s a site up (but not much is there yet, although soon we’ll be reviewing other books etc so get on the RSS). doesn’t mean he thinks you should be listening. they were good. Exit Strategy is a short ride, but a long journey. Exit Strategy . Read it. I need to start building my own Hall of Awesome in my mind. But maybe with gold! 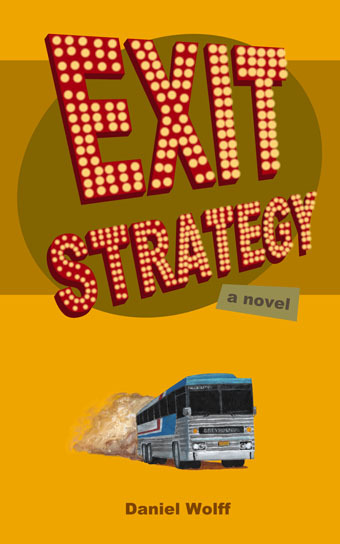 have bought Exit Strategy purely on your recommendation, Chris, so I’m expecting good things. Shame you don’t get the cover art when you buy for a Kindle though! Is the protagonist’s wife really called Echidna? (as per page 2)? As in cute but spiky Australian marsupial? I’ll guess I’ll have to read on to find out, but not whilst I’m at work unfortunately. @Jo, I hope you like! I do truly love his prose. Regarding the cover, I think Kindle opens to the first page of TEXT, so try pageturning backwards. The cover should be there (was on mine). @Anonymous, build it with gold leaf. You’ll save lots of money, and besides, if you use solid gold your head will become too heavy for your neck and it’ll keep crashing into the keyboard. Unless you make your statues really small, in which case what are they doing in a Hall of Awesomness? What you want is called Tumbaga or Corinthian Bronze. It’s a bronze alloy with a bit of gold mixed in. If you wash a tumbaga/Corinthian bronze statue in acid, it dissolves the copper and such out from the surface, so the “skin” of the statue is just gold. Since it’s actually intrinsic to the statue, it’s a lot more all-weather and maintenance free than gold leaf. This is what the mesomericans and the ancient Greeks (and their neighbors) did when they wanted something made of gold that was too big to be made of gold. Bronze is better than gold for statues because it’s more structurally sound (gold being both super soft and super heavy and all). It also lasts about as close to forever as you can get. Seriously, when all the concrete and steel and marble et al has crumbled, future alien archeologists will still know of us from our bronzework. This is part of he reason bronze is till the #1 material for big damn outdoor art. The other reason patinated bronze is favored by artists is because it’s very comfy on the eyes while at the same time falling within the sweet spot for the human eye’s ability to see detail. A sculpture is all about three dimensional form and surface detail, so the ruddy or greenish color(s) of patinated bronze is all about maximizing the eye’s ability to distinguish those elements with a minimum of distraction/confusion. Gold by contrast is very bright, casing form and detail to get visually softened or washed out. Making a statue of gold is more of a symbolic thing. Specifically it’s a wealth symbol. That symbol comes at the cost of likeness or artistry though, for the above reasons. This is part of why a Trump-style overconcentration of gold comes off as tacky: it implies an insecurity about money on the part of the patron (i.e it implies their concept of self worth, and thus the worth of others, is tied foremost to money), since the symbolic value of the gold is valued above and at the cost of, say, a statue’s pose, expression, subtle body language, and stylistic touches in the sculpting. The stuff that would communicate the actual character or personality or circumstances of the subject beyond just “rich”, in other words. The other part is that it’s very very bright: too much of it zots they eyeballs, making it garish and uncomfortable. Alien nature seems very diffrent from Human nature. Not the lax security, that happens. That someone might prefer to be weak and have no choice about whether to fight or not , that doesn’t happen. Not so! That was a great read and entirely coherent, so you still have your full daily allowance of incoherence intact. Thanks for the entertaining comment. “[I]t’s what’s underneath that counts.” How far underneath depends on the species. Have we ever seen Choan *not* smiling? It’s starting to creep me out. I could easily see her with that same big happy grin while chopping someone up with a chainsaw. @zb, what’s the problem? Choan is just one of those people … er … beings … that gets a great deal of satisfaction out of her work, whether that work is bringing down the GOB, fixing spaceships with giant robots, or dismembering romantic rivals. If she didn’t enjoy it, she wouldn’t do it. I’m totally going to start a Hall of Awesomeness in my mind now. In fact I’m crafting the Spacetrawler exhibit right now.